1C. Minkenberg (e-mail: cyriel.minkenberg@rockleyphotonics.com) and G. Rodriguez are with Rockley Photonics, 57 Woodstock Road, Oxford OX2 6HJ, UK. 2N. Kucharewski is with Rockley Photonics, 150 S Almaden Blvd, San Jose, California 95113, USA. The reach of electric transmission lines has been shrinking with the increase of per-lane signaling rates, causing the proportion of ports that need to be optical to increase substantially. At the same time, the cost of switch ports has dropped faster than the cost of optics has, leading to a situation where the cost of the data center’s network is no longer dominated by the switches but instead by the optics. We propose high-level models expressing total network cost per billions of bits per second (Gbps) per endpoint, capturing the essential cost/performance trade-offs between switch ports and optics that drives the decision of choosing one architecture over another. 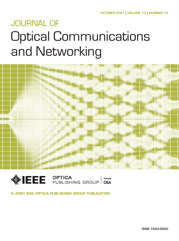 Given the switch radix and the target network scale, our model yields the lowest-cost Folded Clos topology for given values of the relative cost between electrical switch ports and optical ports. We also consider the potential impact of employing integrated, co-packaged optics, which opens a new space of architectural choices with the potential for significant cost and energy savings. Our analysis reveals that the conventional wisdom that “a larger switch radix is always better” does not always hold true; in some scenarios, smaller-radix devices can achieve the same scale while enabling lower cost and lower power per port. Moreover, we find that integrated optics enables a repartitioning of functionality that gives rise to a new class of switch architecture that minimizes total per-endpoint network cost.